Please see below for a call from BARS’ President, Nicola Watson, for expressions of interest in the role of postgraduate representative on the BARS Executive. As a former postgrad rep, I’d encourage you to apply if you’re intrigued and eligible – it’s a very rewarding post. Historically, BARS has always been concerned to support postgraduate and early career researchers and teachers in the field. This remit means that the constitution of BARS requires that the executive should include one co-opted post-graduate to represent post-graduate members and students in the field more generally. The position of post-graduate representative on the executive of the British Association of Romantic Studies is due to fall vacant in the autumn of 2014. Post-graduate members serve for a term of two years (renewable according to the status of their studies), during which they will attend four executive meetings, and will have the opportunity of co-organising special post-graduate events at the BARS international conferences (BARS 2015 will be held at Cardiff) and the BARS biennial postgraduate and early career conference (due to be held next in 2016). The position therefore offers experience in conference organization and in running an association, together with excellent networking opportunities. Most importantly, it therefore offers the chance to help shape and support the postgraduate community within Romantic studies. The post is unpaid, although travel expenses are met by the Association. Eligibility: We are looking for someone who expects to have postgraduate status until the summer of 2016. Please send expressions of interest, together with a one-page curriculum vitae including a brief description of your research, to the Secretary of the Association, Helen Stark, at helen.stark@newcastle.ac.uk, copying in the President, Nicola Watson, at nicola.watson@open.ac.uk. The deadline for expressions of interest is 1 September 2014. If you would like to discuss the position further with a current or previous post-graduate representative, please contact Helen Stark in the first instance. Please see below for the programme for Making, Breaking and Transgressing Boundaries: Europe in Romantic Writing, 1775-1830. For registration information, keep an eye on the conference site. 2.30pm – 4pm: Radical Women, Radical Fictions? Dr Mark Sandy is a Senior Lecturer in the Department of English Studies at Durham University. His research focuses primarily on Romantic poetics and legacies, paying particular attention to the intersections between poetry, philosophy and theories of subjectivity, but he has also published on twentieth-century writers including F. Scott Fitzgerald, Saul Bellow and Toni Morrison. His first monograph, Poetics of Self and Form in Keats and Shelley, was published by Ashgate in 2005; subsequently, he has edited and co-edited essay collections on Romantic Echoes in the Victorian Era (Ashgate, 2008), Romantic Presences in the Twentieth Century (Ashgate, 2012) and Venice and the Cultural Imagination (Pickering & Chatto, 2012). Below, we discuss his latest monograph, Romanticism, Memory, and Mourning, which was published by Ashgate last November. 1) How did you come to realise that Romanticism, Memory, and Mourning was going to be your next monograph project? My first book had focused on ideas about subjectivity and notions of the self as fictional in the poetry of Keats and Shelley. The writing of this earlier book led me to think about these Romantic poets in the context of post-Romantic thinkers, especially Nietzsche. Through this work I become increasingly alert to those darker, if you will, ‘existential’ aspects of Romantic poetry which tried both to defend the self against the contingencies of life and to affirm those tragic realities of existence. It was this increased awareness of these darker ‘existential’ aspects of the poetry of Keats and Shelley which first started me thinking about whether there were similar poetic modes of consolation and disconsolation at work (in various ways) within the poetry of other writers of the Romantic Period. These initial thoughts made me wonder whether there was the possibility of this being the basis for a larger project and became the first inklings of my second book. 2) The book focuses the ‘Big Six’ canonical Romantic poets, but also on Charlotte Smith, Felicia Hemans and John Clare. How did you come to choose these authors as your principal subjects, and were there other writers you considered including during the course of composition? In some respects, I suppose, Wordsworth has a lot to answer for as he was my first, so to speak, ‘test case’, but his poetry quickly reminded me that individual and personal grief (whether fictional or actual) are bound up with acts of memory. The idea of memory as a forcibly creative presence, then, helped to shape much of my thinking and writing about many of the other Romantic poets that subsequently found their way into Romanticism, Memory, and Mourning. Because I wanted to see how central (or not) this connection between memory and mourning was to the other canonical Romantic poets I included the so-called ‘Big Six’, but I also wanted to gain a sense of whether these preoccupations were featured in the writings of those (like Smith, Hemans, and Clare). I needed to get the measure of whether (or not) what I had started to see as a peculiarly Romantic fascination with memory and mourning was a genuine preoccupation within a broader sense of Romanticism (one that encompassed first-, second-, and third-generation poets). As for other writers that I might have included: certainly, the poetry of Barbauld and Landon speaks to many of the preoccupations of the book in its finished form. 3) To what extent do you believe that there is an overarching and peculiarly Romantic attitude to memory and mourning, and to what extent are the attitudes of each the poets you examine distinctly their own? From what I have said, I agree it might seem that I am suggesting that there is an overarching Romantic attitude to memory and mourning. And to a degree, I think that’s true. Perhaps more accurately, though, it is the interplay between memory and mourning that comes into a more distinctly sharp focus in the Romantic period. What, however, really interested me was the numerous ways, at the level of poetic treatment and technique, that this shared concern with memory and mourning works its way out in the poetry of individual poets. For example, the bid that Wordsworth’s poetry makes towards consolation and communal memory often reminds Wordsworth of the limitations of his model of poetic consolation. By contrast, Coleridge’s poetry initiates gestures towards wider society only to find consolation in the introspective inter-play of language that allows his speakers, at least, imaginatively to engage with the outer world. To give another instance, Byron’s anxieties over posthumous reputation find expression in his representation of public history and the fallen civilisations of Greece and Rome, whereas Shelley’s similar authorial concerns are expressed through inwardly turned quest romances. 4) Did the monograph project influence the two essay collections on Romantic legacies which you edited during its composition (Romantic Echoes in the Victorian Era and Romantic Presences in the Twentieth Century)? Was it influenced in turn by the research included in these volumes? Yes, definitely. 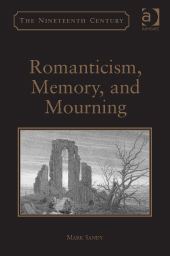 Romantic Echoes appeared when I was just beginning to think about memory and mourning in Romantic poetry and the collection on Romantic Presences was published when I was a good way into the writing of Romanticism, Memory, and Mourning. So, in many respects, my thinking about Romantic legacies and dialogues (across different periods and within the Romantic period itself) has certainly been an important influence on the shaping of my second monograph. Perhaps this is most evident in the chapter on Smith and Hemans, as well as the coda to the book which traces the grief-stricken trope of birdsong from the Romantics through Tennyson, Hopkins, and to Yeats. This question of Romantic inheritance and indebtedness has been a fascination of mine for some time now and led to the founding, with my colleagues Michael O’Neill and Sarah Wootton, of a research group (at Durham University) focused on ‘Romantic Dialogues and Legacies’ in 2005. 5) What new projects are you working on at present? I am presently co-editing a collection of critical essays on Decadent Romanticism, intended as a companion volume to Romantic Echoes and Romantic Presences, which addresses the relations between literary and cultural decadence and Romanticism. I am also working on a book-length study of legacies of British Romanticism in twentieth- and- twenty-first century American literature, provisionally titled Transforming Romanticism: New Trans-Atlantic Dialogues in Romanticism and the Environment. At a later point, I also plan to return to the more mournful topic of ghostly figures, apparitions, and spectres in Romantic poetry. Please see below for the timetable for the Royal Literary Fund and the Perils of Authorship symposium, which will be taking place next Friday (May 9th) at the British Library. Twould be great to see BARS members there; tickets can be booked through the British Library Box Office.